Well. I'm back at work this morning. Unfortunately I still do not have a fully functional voice. #sigh . Last day of anti-biotics and meds today tho. Fingers crossed this gets itself sorted out asap. So the weekend was pretty quiet, really. I mean aside from the few things I had already planned and arranged I didn't do anything but hang out quietly at home, resting my voice and watching a ton of series. Yes, there can be too much of that! On Friday evening, en route to my birthday party, The Trucker and I collected the keys to our new home :) YAY. Yes, things are actually happening this time. 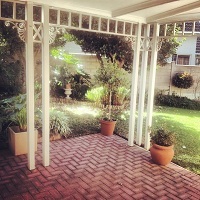 We popped past to have a look at our new place on Saturday morning before breakfast and I'm getting really excited. While I know I will miss my very own home, and I will. It still has a piece of my heart. I am excited to move on to this new adventure, together, with him <3 Somewhere that is ours, equally. Whoop whoop. I suspect tho that May will turn out to be quite the exhausting month tho. We've already missed 1 of the 4 moving weekends available to us. And we have almost full-day Saturday plans for the next 2 already! And we have so much shuffling around to do. We're going to be starting with the weekday evenings, moving a little bit at a time ... or probably a Mahindra-load at a time, depending on when The Trucker can borrow the work bakkie. We will start moving all of his stuff from the place he was renting (where his sister and niece are still living), least impact. Along with that will probably be all the non-essentials from my house as well. Book shelves and whatnot from the spare room. Then Hopefully one Sunday we'll manage to move our essentials and officially move into the new house ourselves. And then we need to get the ceiling fixed at my house (needs to be scraped and re-painted after the whole new-light installation) and then we can move his sister out of storage and into my place where she'll be renting. Sheesh. And all that before the 01 June when there'll be new tenants taking over The Trucker's current lease. Yep. It is going to be an exhausting month! So yes, Friday evening was my birthday party. I booked out the Smoking Bar at Cafe Mexicho because it meant of the 50 or so people I invited, people could come and go, order drinks and food and I could see everyone ... without trying to book a massive table where everyone is stuck in a seat. It was a quiet affair, what with me only being able to manage a whisper. But on the plus side, the anti-biotics didn't get me instantly drunk :) It wasn't as well attended as I'd hoped. Well I did only throw it together with a week's notice, so quite a few people had other plans. And in typical style, there were people who didn't bother to rsvp and others who didn't show up on the day. And this is why I prefer the more fluid kind of event than a fixed booking for a specific number of people. People are flakey. Yeah, I could've canceled due to illness, if it hadn't been my party, I definitely would've stayed home. But I figured cancelling affected more than just my plans. I had a good time regardless. The food and drinks were good and I appreciated the company of everyone who did come thru :) I had a lovely evening. On Saturday, after visiting our new home, we had breakfast at Vovo Telo, where we bumped into and joined a friend of The Trucker's for breakfast ... who happened to be there for breakfast with a guy I was in matric with who was up from Cape Town visiting her (what are the chances?!). 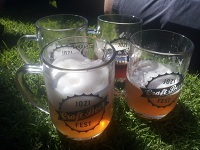 Then it was off to the Jozi Craft Beer Fest. And that was pretty much my weekend. We left the Beer Fest early because The Trucker had a bachelor party to go to. And later in the evening I won the Girlfriend of the Year award. He'd asked me to collect him and the Father of the Groom (the Groom is one of his best friend's, the one we're off to visit in Bermuda later this year, little brother) because they weren't interested in staying with the Party Bus all night. So I duly headed off to collect them from Teasers at around 22h30 when he'd asked. But they all had their rubber arms twisted and decided to stay after I arrived. So I left them there and headed off home, to sleep. Sweet thing showed up at about 2:30am knocking on the door. Haha. He was a little exhausted so Sunday was a slow day with some breakfast at home. The ant-biotics had knocked me so I retired to the couch for the rest of the day while he did our grocery shopping and went off to cricket (no idea how he managed that! Haha). Speaking of Bermuda and our trip in September/October, plans are in full swing. We are waiting to finalise exact dates with The Trucker's friend because he is off to South America around the same time ... and obviously we need him there when we arrive :) But we are making plans for the USA leg of the journey and what we want to do ... which is mostly up to me since The Trucker has been like 3 times already. So some of it is ticking things off my list (go to the Le Brea Tar Pits in Los Angeles, visit the Mütter Museum in Philadelphia) and some of it is him showing off some of his favourite places. There'll be a few nights in New York, where top of my list is High Line Park (not sure why, I know it isn't the obvious choice - haha). The Amtrak trip to Philadelphia and then on to Washington so we can go and check out some of the Smithsonian (Hoping to fit in Natural History and Air & Space and maybe even a visit to the National Zoo). We'll probably fly to Vegas ... mebbe get married by Elvis - har har. Actually, I'm only half kidding, for some reason, I think because I like the idea of unique experiences and this is a pretty damn famous one, I've always wanted to do a 5 or 10 year renewal of vows by getting married in Vegas by Elvis. Even tho I detest Elvis. It just seems like the thing you should do in Vegas. Then do a mini road trip via Los Angeles to San Fransisco. And visit Alcatraz :) And then, of course, finish with nearly a week in Bermuda :) But, first we have to get those pesky UK Visa's sorted :P Still, super exciting. Having never been to the States, I am really looking forward to this. Anybody got some other "Do Not Miss" sort of things you think I should do in these cities? I adore Museums, but The Trucker doesn't ... so I may not be able to wangle any more into our itinerary ... but still let me know, perhaps another trip ;) Oh, but not the Art museums. Those are not my thing. I'm more Natural History and whatnot. I know everyone says go to the Empire State Building, but that doesn't especially appeal to me either. So yeah, anything else? I am looking forward to a San Fransisco downhill tram trip too :) And top of The Trucker's list? An In-n-Out Burger ... Hahahaha.